A baseball cap with an extra bill that flips up to display a message isn’t likely to win a Nobel Prize. But the two brothers behind the Rally Flip Cap hope the novelty headware will be popular among sports fans who want to show their support at live events. 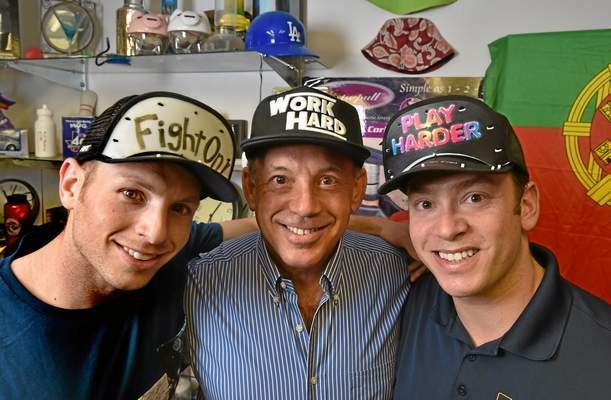 “It really solves the problem of having a novelty hat,” said Ian Kay, who came up with the flip cap idea with his brother, Jordan Kay, while working at their father’s promotional product supply company in Torrance. Most novelty hats are so goofy that people only wear them once. With the Rally Flip Cap, you can walk down the street without inviting bewildered stares. But when you want to get crazy at a ballgame, or simply draw attention to yourself with an outrageous phrase emblazoned across your forehead, just flip the bill fold up and let the good times roll. A deal with Spencer’s Gifts, a shop that specializes in off-color novelty items, is pending. The hats are available at the Rally Flip Cap website and at skate shops Urban Skate in San Pedro and Maui and Sons in Venice. Sales are in the double digits since the product launched before Christmas. The Kay brothers are trying to strike licensing deals with college sports teams. If the idea takes off, getting the caps into baseball stadiums would be a logical next step. However, to secure those sorts of deals requires sales guarantees of $1 million, Ian Kay said. The Rally Flip Cap idea was bankrolled by the Kay brothers’ father, Neil Kay, who owns Cisco Sales Corp., a promotional products company. Digital piggy banks, Christmas-themed mugs, branded tote bags, trophies and inflatable guitars are some of the thousands of novelty gift items that Cisco Sales provides its mostly corporate customers. Neil Kay, who has partnerships with more than 100 factories in China, has been in business for 39 years. With a little luck, some of that success will rub off on the next generation of tchotchke manufacturers. Reach the author at jordan.england-nelson@langnews.com or follow Jordan on Twitter: @jordanenelson. Thanks for the feature Dude I Want That!